I tell you-I had a VERY hard time taking off that Aruba Blue polish from the other day. I was enjoying it SO much that I almost left it on for more pure enjoyment. But then I thought you guys would be so sad without my bright happy posts (HAHA) that life just wouldn't be the same. So for you I got out the polish remover. Today I picked Rescue Beauty Lounge No More War. Yes I know I do alot of RBL, but I just love them and have a few! 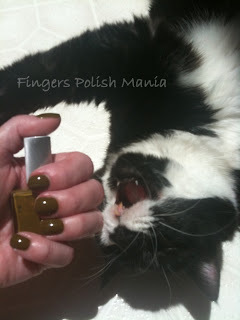 This polish is so dreamy, it's an olive khaki green drab with yellow undertones. I wear this color often. As I was polishing, I realized that this color seems an awful lot like Chanel Khaki Brun which I posted here. I think the Chanel has more brown in it, where as the RBL is more olive, but I didn't have time to do a comparison. Stay tuned-it's on my to do list this weekend. We will have an official dupe off between Chanel Khaki Brun and RBL No More War. I'm tingling with anticipation. Yes I am very weird and little things get me excited. On to the pictures. In a couple of them, you will see Checkers, my beloved baby rubbing her head on me while I was taking them. I decided they were cute so I left them in. I'm a cat person, what can I say? My parents are coming for a visit this weekend, so not sure when the dupe off will actually be posted. Am thinking Sunday if they don't wear me out. We have big house projects planned. Staining, painting, shopping. I'm tired already! I also figured out that blogger added reaction buttons to the posts. So if you're too busy to leave a comment, feel free to click a button. No, really it will make my day. I'm that easy! Thank you! She thinks so!